If you're vegan, or allergic to eggs, finding a wholesome breakfast recipe can be a challange. With that being said, breakfast is the most important meal of the day, so why only eat it in the morning? 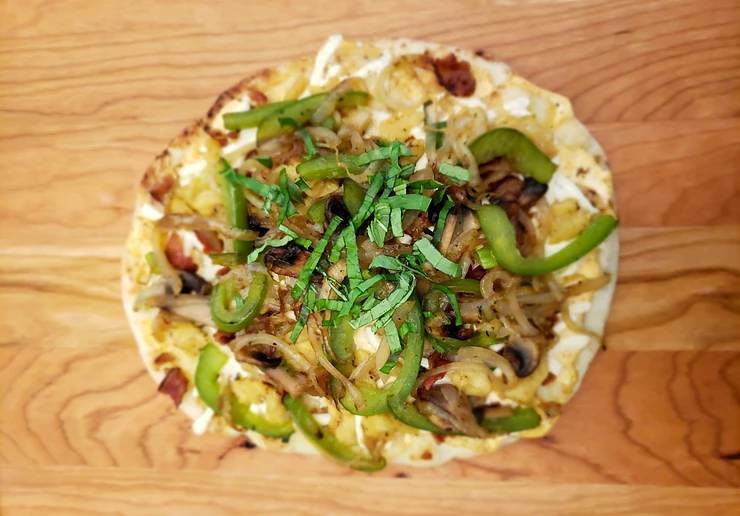 Breakfast for supper is definitely a treat so we elevated this whacky fam favourite into a PIZZA! We did a plant-based spin on the traditional bacon and eggs but feel free to use any breakfast staples. You can also adjust this recipe so you can cook the pizza on the BBQ... perfect for those hot summer nights when you don't want to turn on the stove! In a small dish, whisk soy sauce, liquid smoke, maple syrup, salt and paprika. Combine in flaked coconut. Spread over greased pan and bake for 15 mins (tossing every 5 mins until brown). Combine sour cream, minced garlic, chili, cayenne, salt and pepper in a small bowl. Set aside in fridge for later. Heat olive oil in a small frying pan over medium heat. Add onions and mushrooms. Cook until soft. Add red peppers, cook for 5 mins until caramelized. Set aside. Cook Eggcitables eggs according to instructions, scramble. 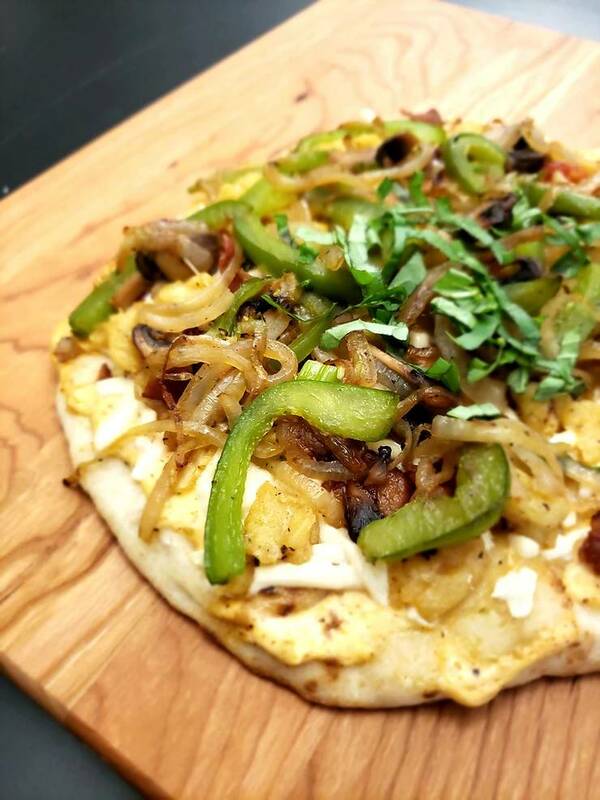 Once bacon is cooked, preheat oven to 4000 degrees C.
‍Spread chipotle sauce over pizza crust. Top with fried onions, mushrooms, peppers, coconut bacon and Eggcitables. Bake at 400 for 6-8 minutes (or until pizza crust is cooked). If using vegan cheese: brush crust with olive oil, top pizza with vegan cheese and broil on high for 2 mins.